Remove your kettle forever with a Hot Water boiling tap! Firstly, when you want to buy a boiling tap go for the best. You will use it on a daily basis and it should serve you for many years. It is not something you want to replace from time to time. The boiling tap comes in handy as it is convenient and saves you a lot of time. They are becoming popular very fast and will be in every kitchen in the next ten years. A very big number of the adult population in USA take coffee or tea on a daily basis. There are estimates that indicate almost 75% of this population take either of these two beverages. That is so many kettles which might soon be a thing of the past as they are very inconvenient and you cannot leave until it water boils. So how will the boiling water tap help you? Well, you will not wait for 3 minutes for the water to boil. You just twist a handle and you get hot water instantly. In addition, you do not use it just for hot drinks. You can also steam vegetables, and whip up some pasta. You do this by turning the taps handle. The greatest thing is that it takes a fraction of a second to do this. Clearly, there are many boiling taps to choose from in the market. Some of them are well known brands like Quooker and are becoming household names by the day. The boiling water is a permanent solution in comparison to a kettle. After the plumber fixes it in your kitchen you are good to go. There is no water wastage as you just have to fill your mug and you are good to go. Do research and ask friends before buying one for your kitchen. A leading brand in boiling water taps, this model comes with everything you need and is easy to install. A 2.5L tank perfect for everyday use. This and hot and cold water tap acts just like a normal tap with the added benefit of instant hot water. No delay, within few second you will have near boiling water coming from the tap perfect for washing pasta, blanching vegetable of making a hot coffee. 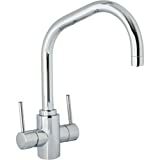 A hot water tap is also ideal for washing down dirty dishes and removing stubborn stains. 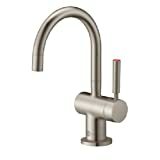 A popular brand that allows a range of different styled taps to be used which also come in different colors too. Simple to use and install InSinkErator taps come with a '3-Year We Come to You In-Home Full Service Limited Warranty'. The 2/3-gallon stainless steel hot water tank is ideal for everyday use allowing you to use the instant hot water for a range of task from making a cup of tea, to blanking vegetables. A stylish chrome design by Groche with a large 4L tank makes this a great choice for any modern kitchen. 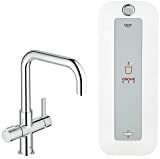 A stylish design that will suit any modern kitchen, the Groche tap has a simple to use push lock system on the boiling water tap, and a push back and forth button or hot and cold water on the right hand side of the tap. This boiling tap is of the highest quality. They have so many features that make it among the best in the market. The tap comes with a filter called HiTAC that purifies your water and makes it taste sublime. It has the best look of any boiling tap. There are also different styles and models you can choose from. There is the square spout, round spout and tap heads that have different designs. The tap has a seven liter capacity. Enjoy boiling water straight from the tap with this combination of classic and contemporary design. This Quooker tap comes with tap, water tank and all the installation kit required. You get a choice between a right or left handle tap, therefore it does not matter the hand you use. It has an ergonomic design and some of this small are what sets it apart. You can buy this with a 3, 7 & 11 Litre Vacuum Tank depending on the size you want and the space you have below your sink. The TH100 is a 3 in 1 instant hot water tap in chrome giving you hot and cold water as well as instant boiling water too at the push of a lever. The CDA TH100CH is top quality. Of the many features it has the filter is outstanding. It works really well and is highly durable. The CDA is quick, the heat up time is impressive, and 7 minutes is enough to heat up the full tank. It is the fastest available in the market. It is one of the best in terms for value for your money. It has a lot of good features and it is cheaper compared to others in the market. The most amazing feature of this tap is its filters. The boiling tap has two filters for double filtration. You are assured of fantastic pure water, and it will let you know when the filter has a problem. That being said, the filters remove all the limescale and they have a carbon remover. This is the reason water from this tap taste so refreshing. Though we refer to them as boiling water taps, the truth is that most of them do not dispense boiling water. In fact, there is a patent on 100 degree Celsius water. The only taps that will give you boiling water are from Quooker. Before you spend over a thousand dollars let us see if you need this gadget in your kitchen or you can continue with the kettle. In many of the boiling water taps, the water stays at over 98 degrees Celsius, though you can adjust the temperatures. By the time this water reaches your cup it is cooler by a few degrees. Does this disparity make a big difference? Definitely not, it will not affect how you enjoy your tea. For coffee lovers, hot boiling water will ruin your coffee. You should let the water cool a little bit before enjoying the coffee. 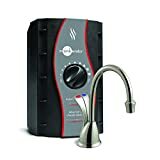 How much do boiling water taps cost? There are people who cannot buy the tap because of the high cost. Though they are expensive, they offer you real value-for-money. They cost around 500 dollars for a boiler and tap. They also have filters that will purifier water as it enters the boiler. The filter prevents limescale from forming inside the tank. It also ensures your drinking water is safe and gives it a better taste. The old boiling water taps were just that, you still needed another tap to do all the other things. It was hard to install both at the same time. Good news is, the modern boiling taps will also serve other kitchen needs. Both cold and hot water come from the same spout. Another point of concern is installation cost. Will you need an electrician and plumber? In most cases you will not need an electrician. What are the operational costs of a boiling water tap? The question on many people’s mind is how much it cost to run one? It all depends on how often you are going to use it. If you use it only to make coffee then it will not be expensive. However, if you are constantly using it, you should be a little concerned. If the place where you live there is hard water, your kettle will form limescale. If this can happen to a kettle, what about a boiling tap which you cannot wash its inside? The solution to this is the filter that comes with the boiling water tap. It removes the hardness and purifies water before it reaches the boiler tank. Thanks to this amazing filter, your water becomes pure and your tank will not clog with limescale. Nonetheless, it is important to note that you will need to replace the filter after sometime. You should replace the filter every 6 months; though sometimes it varies with how often you use it. Every tap has a specific filter, and it is important you choose the best for your tap. Safety should be a top priority for every boiling water tap as you get hot water by just turning the handle. You should avoid injuries at all costs. The hot water taps have a safety handle; you do not just turn the handle and get hot water. To get hot water you press a safety button and twist the handle. The handle has to stay twisted as you fill your mug. Once you release the handle hot water stops coming out instantly. This safety feature ensures you will never accidentally leave hot water running. You and your family will always be safe. Boiling water taps deliver water at a lower pressure than the kettle. This prevents water from splashing and spitting which ensures you are always safe. There are boiling taps that come with a safety lock so that you cannot use it without unlocking it.